Draw a pie divided into as many sections as you'd like. Choose one with ten sections. Cut out the circle and glue that circle onto a cardboard circle of the same size for added thickness and durability. Then use some stickers to make each section of the pie represent a different number. Write those same numbers on the clothespins and you're ready. The children count the stickers and pin the corresponding clothespin onto that section. The Number Wheel is circle, divided into ten “slices” plus ten clothespins with numbers 1-10 written on them. 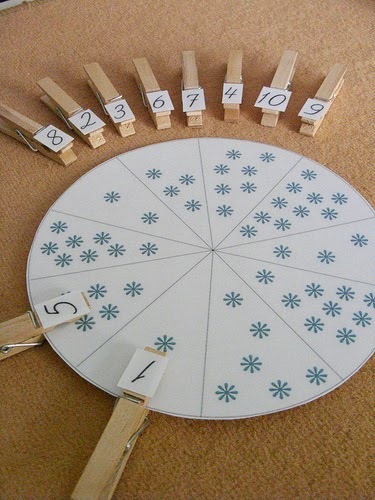 Each slice on the Number Wheel has a different number of dots in it that correspond with the numbers on the clothespins.